Nextcloud has two ways of theming. There is a theming app that provides a web UI to set up theming. The second option allows to overwrite most of the files but a customized theme needs to be created and maintained. For more information on this check out the developers documentation. We recommend to use the theming app, because the Nextcloud team maintains this and verifies that all adjustments to the server work with the theming. It covers also most use cases like replacing the name, logos and colors. Logo: The logo will appear in the header and on the log in page. Default has 62/34 px. Nextcloud will automatically generate favicons and home screen icons depending on the current app and theming color. occ config:app:set theming AndroidClientUrl --value "https://play.google.com/store/apps/details?id=com.nextcloud.client"
occ config:app:set theming iTunesAppId --value "1125420102"
occ config:app:set theming iOSClientUrl --value "https://itunes.apple.com/us/app/nextcloud/id1125420102?mt=8"
This feature was added in version 12.0.1 and 13. 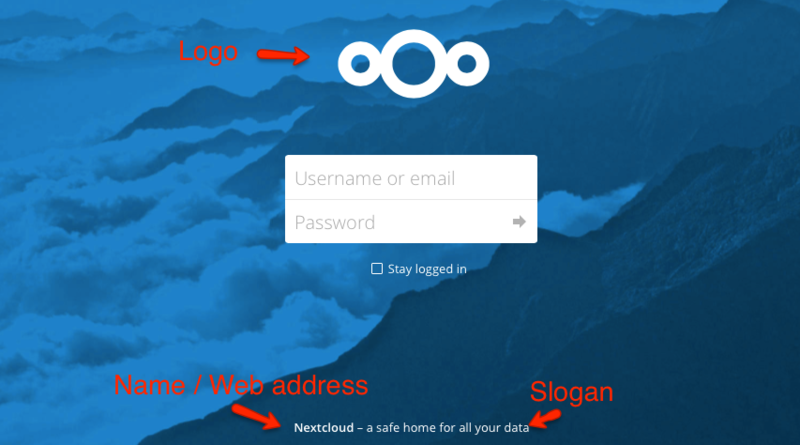 Nextcloud GmbH provides branding services, delivering sync clients (mobile and desktop) which use your corporate identity and are pre-configured to help your users get up and running in no time. If you are interested in our advanced branding & support subscription, contact our sales team.